It is vital to balance the heat dissipation in the industries to continue the operations. Heat distribution to the environment ensures an efficient process. 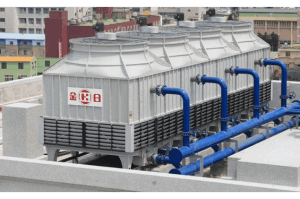 The device that comes in use for releasing the heat to the atmosphere is known as “cooling tower.” Let’s understand the basic concept of how does a cooling tower work and what the varieties are there in the market. A cooling tower performs to cool down the water used in the industrial process. The cooling process is done by combining hot water with air that cools down the temperature. The normal water gets turned into hot water when it goes through the industrial cycle. When using a cooling tower, this hot water enters the tower through the pipes. This flow then slows down by the technology used in the cooling towers. This way, the hot water gets maximum exposure of the air that creates evaporation, and the water cools down. Once the water is cold, it gets back to the industrial process. Hence, the cooling towers reuse the water by repeating this process. Only 5% of water is replaced for the part that evaporates during the cooling process. In a crossflow cooling tower, the air flow horizontally takes places. The air goes over the watercourse using the upper pool. The main advantage is that a crossflow is easy to maintain. For the price, it is an expensive type of cooling tower and also gets vulnerable in the cold. Counterflow uses an air flow that remains vertical when the watercourse comes down from the upper reservoirs. 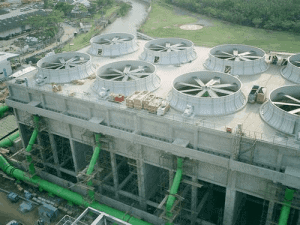 The cooling tower manufacturer makes these in a way that offer less space than a crossflow, and their compact design increases the overall maintenance cost. 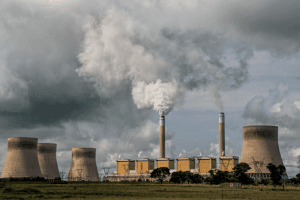 The cooling towers that are huge and seem like the chimneys to many folks are actually hyperbolic systems. They are well-built and used for a large amount of water process in giant power plants. The cooling tower services are not much required. The cooling process is done using the cooler air that pushes the warmer air inside. The fill is placed in the bottom to collect cool water. The tower works by drawing the air at the base using the fan system. This air then travels upwards and gets mixed with the water. As a result, the evaporative cooling tower removes the heat from the water. Its principle depends on the air circulation where the air flows through the water. This process happens naturally because of the differences in the density of the outer air and internal air. The damp air rises through the water whereas the cool air enters the tower. As its name implies, the tower uses only water for the cooling process. There is very less consumption of water as the heat gets into the atmosphere without evaporation. This process gets done by separating liquid from the air. This is advantageous to save a large volume of water. The additional noise can be the only downside. A cooling tower can be the most blissful thing that industry or plant can set up. This ensures you a regular and efficient operation. The most significant advantage is the amount of water you save by using cooling towers in the production. This is not just a wise concept, but an eco-friendly idea as well that saves tons of water every day.